BEIJING, June 26 -- Chinese President Xi Jinping on Monday called "one country, two systems" the best institutional arrangement for Hong Kong's prosperity and stability. Xi, general secretary of the Communist Party of China Central Committee, was visiting an exhibition at the National Museum in Beijing profiling the achievements made in Hong Kong since its return to the motherland in 1997. During the last 20 years, "one country, two systems" has proven not only to be the best solution to historical regional issues, but the best institutional arrangement for Hong Kong's long-term prosperity and stability since its return, Xi said. "We will continue to comprehensively and precisely implement the 'one country, two systems' principle, handle affairs in line with the Constitution and the Basic Law of the Hong Kong Special Administrative Region, and further promote the overall development of Hong Kong," Xi said. 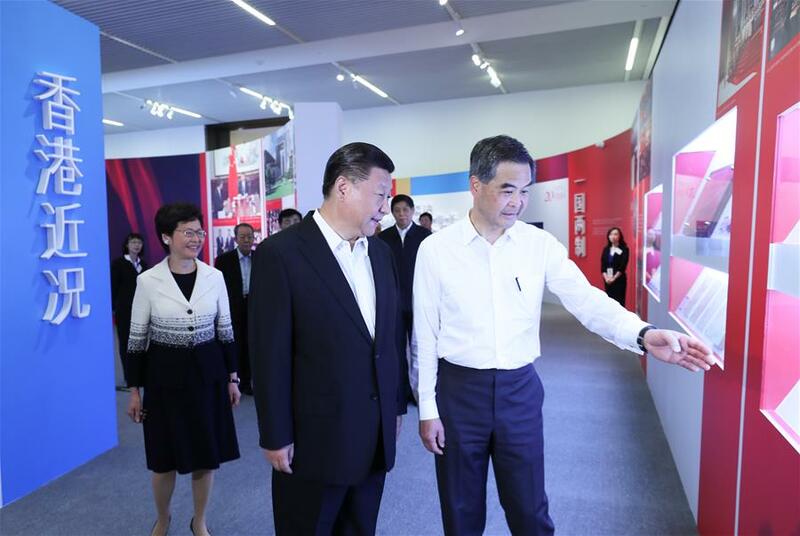 Premier Li Keqiang, and other senior leaders Zhang Dejiang, Yu Zhengsheng, Liu Yunshan, Wang Qishan and Zhang Gaoli, also visited the exhibition.